The Commercialization of Space: Some Actual and Potential Barriers. David C. Webb, Arlington, Virginia. Abstract: Much has been said and written in recent years about the commercialization of space, but little attention has been paid to the actual and potential barriers facing this process in the United States. Only a few minor attempts have been made to identify and remove barriers, and/or create new institutional structures to deal with the different issues that inevitably arise in the introductory phase of any new economic process of this order. As a result, commercialization of space has not occurred with the speed that was originally forecast by its proponents. This paper will attempt to define and examine some of the complex issues that affect this process. Lunar Power Systems-Overview. D.R. Criswell, California Space Institute and R.D. Waldon, Rockwell Space Division. Abstract: A qualitative description of a lunar power system (LPS) is presented. An LPS consists of multiple solar arrays on the moon which feed electric power to segmented microwave transmitters operated as large phased arrays. An LPS can provide power by microwave beams to receivers elsewhere on the moon, in space, or on Earth, either directly or via reflectors. 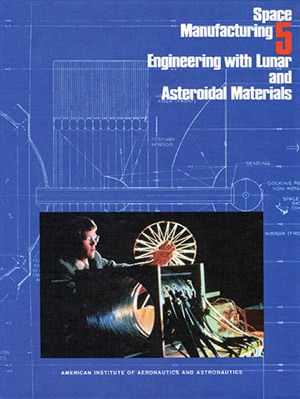 An LPS can be made primarily from lunar materials. The system can start small but grow rapidly. A Lunar Power System can enable new forms of space transportation and growing industries off Earth. Power from Space — An Approach to Achieve the Development of Space Resources. Peter Glaser, Arthur D. Little Company, Inc.
Abstract: The evolution of the space infrastructure provides many opportunities to utilize the inexhaustible energy, materials resources, and unique environment of space. An approach is presented based on the concept of “terracing” of space projects to reduce the challenges associated with macro-engineering projects, including control of the projects, the effects of technical uncertainties, maintenance of investor confidence, reduction of environmental impacts, and the difficulties associated with termination of the project if warranted. The solar power satellite concept is used to illustrate how potential applications of space technology developed in support of existing, or planned, national or international projects could be “terraced” to meet the objectives of this concept. The “terracing” approach applied to space power as a long-range goal could reduce technical uncertainties and risks, while the space infrastructure is being established, and information on the technical feasibility, economic viability, and societal and environmental acceptability of generic technologies is obtained. Current Status of Microwave Power Transmission Technology for the Solar Power Satellite. William C. Brown, Consultant. Abstract: The updating of the microwave power transmission subsystem of the Solar Power Satellite is reviewed in the context of advances in the generic technology of microwave power transmission that have occurred since the conclusion of the DOE/NASA study of the concept in 1980. In addition, the potential reduction of transportation costs from low-earth orbit to geosynchronous orbit by electric propulsion systems involving microwave power transmission is reviewed. Phobos and Deimos (PhD): Concept for an Early Human Mission for Resources and Science. Brian O’Leary, Science Application International Corporation. Abstract: Recent work indicates that the two moons of Mars, Phobos and Deimos (PhD), are more accessible in delta-v more often than any known natural objects in the solar system including the Moon. Launch windows occur regularly every two years. Both satellites are likely to be carbonaceous, containing easily extractable water and other volatiles that could be used for refueling and life support in situ and delivered to Earth orbit and the lunar surface. PhD could become early centers for bootstrapping nonterrestrial resources. PhD provides excellent vantage points from which to control by telemetry unmanned Martian surface rovers and sample collection in real time. In this paper, I present an early mission concept in 1998, 2001, 2003 and 2005 that enables a low-cost initial manned mission to PhD, the establishment of a small processing plant for materials stockpiling, and subsequent returns that enable rapid growth to a space industrial/SPS economy. The Soviets appear to be pushing toward the Mars system with plans for an unmanned Phobos mission in 1988. It is concluded that, for economic, scientific and political reasons, the PhD concept provides a viable focus for dovetailing resource and exploration rationales as a major stepping stone toward a human renaissance in space. External Tank Applications in Space Manufacturing. J. Alex Gimarc, Pineville, Louisiana. Abstract: The Space Shuttle External Tank (ET) is a potential component of an initial Space Manufacturing operation. It can be configured for a variety of applications on orbit to include habitats, storage of volatiles, factory components, and a ready source of raw materials. This paper will discuss current ET usage by NASA as an introduction. Potential uses of the ET in a Solar Power Satellite (SPS) manufacturing scenario will then be discussed. Particular attention will be given to bootstrapping the operation. Advantages and disadvantages will also be discussed. A plan for the early use of the ET on orbit will be proposed as a possible way to get started. It is weighted toward early start, inexpensive operations, modular components, and simple expansion to a full scale SPS manufacturing operation. Energy and Environment Research on the Space Station. Makoto Nagatomo and Kyoichi Kuriki, Institute of Space and Astronautical Science, Tokyo. Abstract: The capability of space acitivities will be enhanced by such features of the space station as permanently manned, construction and assembly, high electrical power, low cost and the evolutional system. The space station is a stepping stone to the large scale use of the technologies developed for space and terrestrial use for the future of mankind. Among various space applications, this paper emphasizes the energy and environmental researches on the space station. The SEEL which stands for Space Energetics and Environment Laboratory is proposed for the space station mission in the later half decade of 1990′s. The research subjects in the SEEL are consisting of energy conversion, power transmission, propulsion, environment monitor and large space structure. The main facility of the SEEL is a bus platform which will provide the onboard experiments with high electrical power and attitude control more conveniently than on the space station base. Work in Progress on the Design of Solar Power Satellites from Lunar Materials. Brian J. Tillotson, Space Research Associates, Inc.
Abstract: The paper presents preliminary results of an SPS design study based on the use of lunar materials. Commercial feasibility is emphasized in designs. Several power conversion concepts are considered. Photovoltaic systems are found to require least non-lunar materials. Use of a microwave lens is found to allow economic construction of smaller SPSs. Flywheel energy storage probably requires less non-lunar material than chemical or thermal storage. Lunar-Based Mass Driver Pulsed Power Supply: Assessment of Homopolar Generators, Compulsators, and Capacitor Banks. Mark Prado, U.S. Patent Office, and David Renfroe, University of Arkansas. Abstract: Developing the great potential of space for the benefit of humanity on Earth, as well as the colonization of space, will require the utilization of lunar and asteroidal material in Earth orbit. Lunar raw material can be cheaply catapalated from our tiny moon thru vacuum to a nearby orbital-based lunar stationary catcher (where it would collect and await an orbital transfer tug). S.S.I. Inc.’s Mass Driver III catapult, designed for such duty on the lunar surface, is a simple linear electromagnetic accelerator “pea-shooter.” It requires pulses of current, which rise in milliseconds to avoid wasting power and necessitate more generation and cooling, and are switched off in tenths of a millisecond or less near the exit. For accurate trajectories, repetitively, precision in pulse timing and energy transfer are important. This study compared three pulsed power sources: 1) capacitor banks (which S.S.I. Inc. uses), 2) homopolar generators (HPG), and 3) alternators (compensated pulsed alternators, or “rotary flux compressors”). Comparison criteria were mainly: performance, efficiency, operational complexity, reliability, energy density (mass), and manufacturability in space using nonterrestrial resources. Capacitor banks appear to be the most attractive overall, for operating an early Mass Driver based on the lunar surface. Nonetheless, homopolar generator technology is evolving from near infancy and holds promise, especially for inter-orbital propulsion. Alternators were deemed unfeasible for precise trajectories due to timing considerations. Clarke Stations and Mercurian Mass-Drivers: Energy for Large-Scale Transportation Systems. Eric M. Jones, Los Alamos National Laboratory. Abstract: Three-week voyages across 1 AU could be made in large sailing craft propelled by microwaves generated at power stations operating at 0.1 AU from the Sun. The power stations could be built of mercurian materials launched by mass driver to building sites in solar orbit. A Clarke Station 28 km in radius could generate 64 TW of microwaves and support the operation of a 1000-tonne, 1000-passenger vessel. The ability to build near-Sun power stations of mercurian materials would not only support high-speed transport but Solar System development in general. The Oblique Detonation Wave Ramjet. Richard B. Morrison, Aerospace Consultant. Abstract: The potential performance of oblique detonation wave ramjets is presented for a propulsion system that consists of the following subsystems: a multishock diffuser, a combustor utilizing oblique detonation waves, and an expansion nozzle. Performance is presented in terms of thrust coefficients and specific impulses for flight Mach numbers of 6 to 16. The results of two oblique detonation wave ramjet conceptual designs are presented for hydrogen-air equivalence ratios of 1/3, 2/3 and 1 for a range of Mach numbers of 6 to 10. Transportation Networks for Lunar Resources Utilization. Gordon R. Woodcock, Boeing Aerospace Company. Abstract: Lunar mission modes are briefly surveyed, from the early Apollo options to future modes applicable to repetitive space station operations. Benefits of using lunar oxygen are summarized, including the supply of lunar oxygen to low Earth orbit. Propulsive modes with aerobraking upon returning to low Earth orbit can achieve net payoff on the order of two for aggressive technology assumptions, but do not pay off for conservative assumptions. If a mass driver is used to deliver oxygen to lunar orbit, the payoff in low Earth orbit ranges from 3.5 to more than 6 for conservative and aggressive assumptions respectively. A representative transportation network, supplying lunar materials to geosynchronous orbit, was analyzed. The payoff factor approaches 20 (compared to supplying everything from the surface of the Earth) when using a mass driver from the lunar surface to lunar orbit and conventional propulsion with lunar oxygen in the rest of the network. If electric propulsion were used for operations between lunar orbit and GEO orbit, payoff factors on the order of 50 are projected. These analyses assumed that all hydrogen for conventional propulsion systems and all propellant for electric propulsion systems would be supplied from Earth. Earth Based Mass Driver. Stuart A. Hirsch, Silver Spring, Maryland. Abstract: With the advent of the 1800 G mass driver the costs of placing materials into geosynchronous orbit can be greatly reduced. When compared with other current and proposed systems, earth based mass drivers represent the lowest capital, time and energy cost alternative. Up until now earth based mass drivers were impractical because of their low acceleration and very massive payloads. However, this is no longer the case when a high acceleration mass driver is employed to fire small payloads in rapid succession. This report will list the advantages of the earth based mass driver, describe the problems involved, and provide a general outline of a practical system. Characterization of the Microgravity Environment Quality Aboard Space Stations and Free Flying Platforms on LEO. Richard Boudreault, Canadian Astronautics Limited. Abstract: The microgravity environment on space stations and free flying platforms will be used to process materials in orbit. The main advantage of Low Earth Orbit (LEO) for material processing (M.P.S.) is the quasi absence of gravity. The microgravity environment of space platforms is reviewed here according to the user point-of-view. This presents different causes disrupting the state of microgravity. The most important perturbations, man and atmospheric drag, are analyzed. A comparison is made of the space shuttle, the space station and the free-flying platforms (Leasecraft by Fairchild and EURECA). Algae Dependent Closed Life-Support Systems for Long Duration Space Habitation. Peter H. Diamandis, Massachusetts Institute of Technology. Abstract: During photosynthetic growth, green algae are able to convert human solid, liquid and gaseous waste products into breathable oxygen and nutritional biomass such as proteins, lipids and carbohydrates. If properly managed, a growing algal culture may be able to support a crew during space habitation. This paper quantitatively and qualitatively examines the use of algae for atmosphere regeneration and food production. It explores the growth conditions needed by the algae, the difficulties associated with sustaining cultures in the space environment, and considers the future applications of an algae dependent life support system. Water Recycling in Space Habitats by Use of Membrane Distillation. David W. Gore, W.L. Gore and Associates, Inc.
Abstract: This paper introduces a new distillation technology which may have application in space environments. This new method makes use of a special microporous hydrophobic PTFE membrane. Requirements for several space applications are outlined and the advantages and drawbacks of various technologies are discussed. The emphasis of this paper is on desalting rather than on the other components of water recycling systems. Regeneration of Atmosphere in Space Ships and Habitats. Valentin Pechorin, Vactronic Lab. Equipment, Inc.
Abstract: New method of regeneration of atmosphere consists of improving the Sabatier Reactor. It permits the transformation of carbon dioxide to unsaturated hydrocarbons. Thus, excess carbon dioxide in the Sabatier Reactor could be decreased and more oxygen could be returned into the cabin atmosphere. This method saves about 300 grams of water per person per day. Lunar Oxygen Production by Vapor Phase Pyrolysis. Wolfgang H. Steurer, Jet Propulsion Laboratory. Abstract: The vapor phase pyrolysis process is designed exclusively for the production of oxygen by means of thermo-physical rather than chemical reactions. Raw material such as lunar soil is vaporized and dissociated; the free oxygen gas is then isolated by condensation of all other gas species. The process does not require any consumables and makes extensive use of direct solar (thermal) energy. A detailed thermodynamic evaluation of the process is presented for individual oxides as well as for an oxide mixture representative of the lunar soil. The gas composition as related to temperature is measured by the partial pressures of the individual species and the oxygen yield by the oxygen weight fraction of the total gas weight. Optimum processing temperatures are in the 2500-3000°K regime which is well within the limitations of direct solar heating. Data are further presented on energy requirements, facilities mass and the overall process efficiency in terms of the facility investment write-off per ton of oxygen, which is in the order of 1.5% (payback ratio 63:1). Process feasibility has been demonstrated experimentally. Total Separation and Refinement of Lunar Soils by the HF Acid Leach Process. Robert D. Waldron, Rockwell Space Division. Abstract: Results of detailed laboratory investigations of a quasi-closed cycle process for separating and recovering all major constituents of lunar soils are presented. This “HF Acid Leach Process” dissolves raw or beneficiated lunar soils in a mixture of fluoroacids (HF & H2TiF6), converts the oxygen to water and separates fluorocompounds of the remaining six major lunar elements (Al, Ca, Fe, Mg, Si, Ti). The fluorocompounds are reduced (with Na) to yield elements or hydrolyzed and pyrolyzed to form refined oxides. Process steps to regenerate all needed reagents are described. A comprehensive engineering (sizing) analysis based on equipment and reagent inventory mass, power and cooling requirements was performed and is reported herein. Reagent replacement requirements are expected to be less than 0.1% of the throughput mass of the system. Metal Carbonyl Refining and Vapor Forming for Asteroidal Ores. Carolyn Meinel, Analytic Decisions. Abstract: Projected space activities may require a significant mass in orbit. Much of this may consist of sufficiently simple to manufacture components that if a relatively low-cost source of extraterrestrial materials were available it may become economically competitive to produce these in orbit. Examples include radiation shielding and structures. Recent discovery of a large class of near-Earth asteroids, many of which are more accessible in terms of delta V than the Moon, suggests these may provide an economic source of raw materials for end users in Earth orbit. Analyses of meteorites found on Earth and comparison of their reflection spectra with near Earth asteroids suggest that many are rich sources of native metals, primarily iron, nickel, cobalt, and economically significant traces of precious and other heavy metals. Radar studies of the near-Earth asteroids indicate they are covered with a layer of loose, readily mined regolith. This paper considers the use of gaseous carbonyl refining and vaporforming techniques to convert the native metals found in stony chondrite meteorites into final products such as structural components for use in orbit. This paper assumes processing of raw materials in orbit at a space station. The native metals of the asteroids are likely to be readily extracted magnetically from their regolith. These metals could then be shipped to an LEO space station, where technicians and resupply from Earth are easier to obtain, for refining and processing into end products. Metallurgical Properties of Lunar and Asteroidal Steels. Andrew Hall Cutler California Space Institute. Abstract: The first step in any space industrialization project and in some conceivable exploration projects will be site preparation and plant construction. It is economically desirable to use local materials for this. Metals are the engineering materials of choice in most situations. Native iron is readily available on the moon and on many asteroids. In addition, iron is a likely byproduct of oxygen manufacture on the moon. The engineering use of extraterrestrial steel is discussed, and its properties are compared to those typical of terrrestrial steels and to other engineering materials. Typical methods of production and difficulties expected in the space environment are discussed. Steel may also be a valuable product for export to LEO or other locations. If its economy is recognized during preliminary design definition, very attractive savings can be realized by using steel instead of more expensive materials. The purpose of this paper is to make the Space Industrialization research community aware of the economy and utility of steel in the space context, so that space manufacturing system startup costs can be kept to a low level. Composites: Fibers and Matrices from Lunar Regolith. W. Brandt Goldsworthy, Goldsworthy Engineering, Inc.
Abstract: Lunar structural materials investigations to date have centered primarily around traditional metals. Economic and properties advantages, however, indicate that composites could be a better alternative. Analysis of Apollo samples has established that all the elements are available in the lunar regolith for production of composite raw materials. Fiber-producing feldspar and basalt are plentiful, and enriched blends could be capable of producing the equivalent of Earth’s high performance S-glass. While the lunar regolith yields no organic matrix materials, it appears that a low temperature melt, frit-like matrix could be developed from available elements. The indicated path is therefore towards generation of techniques for making a glass/glass composite. The highly efficient production of fiber and matrix materials as a continuation of oxygen extraction is being investigated. These and other related concepts will be explored in detail during the tenure of this study. Lunarcrete: A Novel Approach to Extraterrestrial Construction. Larry A. Beyer University of Pittsburgh. Abstract: A novel approach to construction of lunar structures is presented. This approach uses mostly indigenous raw materials with little or no processing and is based on an existing terrestrial technology used in the refractories industry. The main features of the current lunar concrete proposal are: placement and curing can be accomplished without the use of water or the control of ambient temperatures; raw materials are abundant and therefore inexpensive; completed structures contain air at least as effectively as a metal shell; and monolithic structures can be prepared from lunarcrete quickly and easily. Lunar Cement Formulation for Space Systems Shielding and Construction. William N. Agosto, Lunar Industries, and Ahmed M.M. Gadalla, Texas A&M University. Abstract: Concrete is perhaps the most versatile structural material and offers a combination of advantages to space construction and adhesive applications not available in metal or composite space structure designs. Desirable space structural properties of concrete include radiation and impact shielding as well as fireproofing, hazard isolation and the flexibility of in situ structural shaping. The moon is rich source of the major constituents of terrestrial cements like SiO2 Al2O3 CaO and FeO. It is estimated that 95% of the mass of space concrete could be derived from lunar sources including lunar oxygen for the water content. Low alkali lunar glasses may have pozzolanic activity similar to terrestrial volcanic materials that were used in mortars of ancient structures and are still in use. Highland anorthosites are the richest apparent source of lunar CaO and Al2O3 and might be pyrolized in vacuum to yield refractory cement compositions. Enriching anorthosite with alumina rich material can produce refractory cements that withstand temperatures up to 1800°C for prolonged periods. Addition of CaO and SiO2 to lunar anorthosites could adjust the composition to Portland cement levels. Concrete aggregate could be derived from lunar basalts and oxides as well as iron produced from vacuum pyrolysis of lunar basalts. Lunar oxygen for water manufacture might also be derived from basalt pyrolysis or hydrogen reduction of lunar ilmenite. Significant quantities of solar wind hydrogen may be extractable from lunar soil fines. The water of hydration in space mixed concretes that are properly cured is likely to be retained as well as the water in carbonaceous chondrite meteorites that has survived millions of years in the space environment. The Evolution of American Space Interest Groups, 1980-1985. Trudy E. Bell, IEEE Spectrum. Abstract: Between 1980 and 1985 there has been a steady evolution in the aims, effectiveness, and reputability of American space interest groups. This space-interest community seems to have matured beyond a rapid-growth phase and may have reached a stable natural size. Between 1980 and 1984 the number of groups has increased by half (from 33 to 48); their aggregate budgets have more than doubled (from $13.5 million to $30.5 million); their aggregate membership has more than tripled (from 82,500 to some 300,000). Important trends since 1980 have been the rise of pro-military space interest groups, the advent of corporate funding, the increasing professionalization of groups’ membership and activities, and the transfer of young leadership talent from space interest groups to commercial space enterprises. Evidence also suggests that it may be more accurate to view these groups as part of a loosely-bound space interest community instead of actors in an overall space movement. Free-Fall Culture. William E. MacDaniel, Niagara University. Abstract: Culture is defined as the way of life of a human social group that is transmitted symbolically from generation to generation; its function is to enable man to survive in a particular environment in the absence of the genetically transmitted behavioral patterns that characterize other species. Since culture is related to the environment, through its survival function, and since the extraterrestrial environment differs considerably from that which is found on Earth, it follows that unique cultural patterns will develop in the extraterrestrial environment. This paper examines one unique feature of the extraterrestrial environment, free-fall or weightlesness, and the impact that it is likely to have upon cultural development in space. A scenario for development of free-fall culture is presented and followed by brief discussions of several Earth culture traits that may be problematical in free-fall. The author concludes that sociocultural analysis of space plans and programs is necessary, and that the developing free-fall culture should be monitored with an eye toward social intervention when required to assure that dysfunctional patterns do not become integrated into the developing space culture. Preventing Adverse Physiological Change in Long-Term Spaceflight. Paul C. Rambaut, NASA Headquarters. Abstract: The countermeasures presently employed to prevent adverse physiological change in long-term spaceflight are reviewed. Procedures are outlined for employing drugs to prevent motion sickness; exercise, anti-g suits, rehydration and lower body negative pressure treatment to prevent postural hypotension; compressional suits to prevent osteoporosis and mass shielding to prevent radiation injury. It is reasoned that adequate measures probably exist for the preservation of cardiovascular and musculoskeletal integrity but that there are inadequate techniques for shielding against cosmic radiation. This factor will limit the duration of manned missions beyond the magnetosphere for the forseeable future. Legislative Perspective on the Climate for Space Development. Darrell R. Branscome, House Committee on Science and Technology. Abstract: This paper discusses the National Aeronautics and Space Act of 1958 which provides the policy guidelines for our civilian space program as well as the evolution of our space program under six Administrations. Changes in character and major trends in our space activities are discussed. Space commercialization/privatization efforts are discussed including two pieces of legislation related to Landsat and Expendable Launch Vehicles. Issues associated with the Space Transportation System and the Space Station are also discussed. Financial Climate for Space Development. Wolfgang H. Demisch, First Boston Corporation. Abstract: Although the current financial climae for space development is good, legal, technical, and market uncertainties are likely to constrain the pace of progress. Private Rights and Legal Interests in the Development of International Space Law. Stephen Gorove, International Institute of Space Law. Abstract: This article starts out with a brief description of the increasing role of private enterprise in space activities and moves on to a discussion of private rights and legal interests in the development of international space law. The subject areas touched upon include: freedom of exploration and use of outer space; acquisition of natural resources and protection of rights in property, including proprietary data, trade secrets and retention of profits; assistance to distressed astronauts and claims for death, personal injury or property damage. The article concludes with a brief reference to some of the areas where international space law could further be developed for the protection of private rights and interests. International Project Financing Techniques Applied to Space Stations and Habitats. Martin A. Rothblatt, Geostar Corporation. Abstract: The paper discusses international project financing as a tool for realizing space station and space habitat projects. Because project financing uses the revenues generated from the project financed to repay the financing, it is ideal for projects where there is high risk and little in the way of security involved; hence, its applicability to space projects. The criteria for project financing on the international level and working examples of projects utilizing this method are discussed and related to the theoretical feasibility of using the same type of financing for space stations and space habitats. Transportation Economics of Extraterrestrial Resource Utilization. Andrew Hall Cutler California Space Institute and Man L. Hughes, CSR Consulting. Abstract: It is assumed that the utilization of space shuttle external tanks as an extraterrestrial resource is economical, as it would be ridiculous to discuss the use of lunar or asteroidal resources if this were not true. Due to the restricted composition and limited nature of this resource, the exploitation of lunar and asteroidal resources is worthy of consideration. Several conclusions can be drawn from a consideration of the economics of mining the moon and asteroids. It is shown that production of lunar oxygen or steel for use in LEO is economically justified in the near future, and is superior to the use of asteroidal resources. Production of lunar hydrogen, if feasible, is not desirable from an economic standpoint until a lunar oxygen producing facility is on line and delivering oxygen to LEO. In determining economic feasibility high mass payback ratios are not particularly important. Low initial capital investment is important. Thus steel for uses such as SDI is a more economical product than oxygen for propulsive or other uses. It is found that optimizing and comparing selected physical parameters such as delta V or Isp does not in general lead to the most economical system. Two major questions are identified which have a major impact on extraterrestrial materials utilization economics. These are the minimum acheivable ratios of dry mass to loaded mass for the transport vehicles, and the ability to manufacture at the mine mouth. Dry to fully loaded vehicle mass ratios must be less than 6% or so if there is any hope for economical transportation. The ability to perform manufacturing at the mine mouth is probably dependent on human presence for repair. Energy Embodied Technical Progress and Space Based Backstop-Technologies. Reiner Kummel, Physikalisches Institut der Universitat Wurzburg. Abstract: Analysis of industrial growth in West Germany and the U.S.A. by energy dependent production functions reveals energy as a factor of production which represents embodied technical progress. Future economic growth and stability are expected to depend upon the modes of industrial energy dissipation. True backstop-technologies which permit unrestricted technical progress are conceivable primarily in conjunction with extraterrestrial resources and production sites. A Proposed Ground Based Experiment to Predict the Magnitude of Artificial Gravity Needed to Prevent Space Flight Osteoporosis. L.W. Schultheis, University of Pennsylvania School of Medicine. Abstract: Osteoporotic bone lesions have been documented in man and experimental animals following space flight. Radiologic evaluations 5 years post-flight suggest that bone damage may be permanent. Exercise regimens have not proven to be effective countermeasures. The experiments suggested below are designed to predict the magnitude of gravitational force needed to prevent bone atrophy in orbit or deep space. Adult dogs are suspended in harnesses that lift a known fraction of their total weight off their legs. The animals are free to walk about normally, but the force on the distal leg bones is set at only 25%, 50% or 75% of normal. Bone changes are quantitatively assessed by calcium balance, gamma absorptiometry, dynamic histomorphometry and ultimate torque. Stepping Stones into Space. James H. Sloan, Carson, California. Abstract: Consider the impact on the industrialization of space by a launch vehicle capable of delivering 1,300,000 lbs/yr to orbit at one percent of the Shuttle’s price. Let us further imagine that this vehicle is limited to carrying raw materials so that on orbit industry is encouraged to develop in place of importing equipment from the Earth. Such a vehicle need not wait for the next generation of Shuttle. The Space Shuttle can carry its External Tank into orbit at little cost. The technology to maintain the Tank on orbit could be developed in the next few years. The Tank is richer in Nitrogen, Hydrogen, and Carbon than the soil of the Moon. It is far more accessible than the asteroids. Its one flaw is that it is a limited resource that will one day vanish. The Tanks can be used as stepping stones into space, creating a market for raw materials on orbit and lowering the cost of reaching other sources of raw materials such as the Moon, the asteroids, and Earth’ s atmosphere. The opportunity to utilize the Tank’s resources comes with the creation of the U.S. Space Station, leaving only eight years to prepare a privately funded program. Each year that passes beyond that goal means fewer tanks will be available and the project will grow less attractive.